Blog Home > Competitions > Congratulations to the winner of our X-TEX Competition! ECO Solutions’ range includes effective, solvent-free removers that strip paint, spray paint, Artex and more. Over the past couple of weeks we have been running a competition with our friends ECO Solutions to promote their great textured coatings remover, X-TEX. 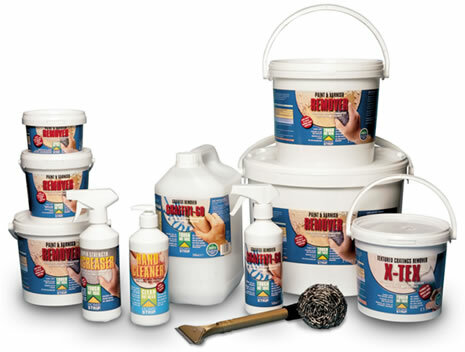 ECO Solutions’ range of paint and coverings removers are different because they are water based rather than solvent based, meaning they don’t contain any of the hazardous solvents that feature in most standard strippers – in fact, ECO Solutions’ products are non-toxic. This makes them safer for you to use and safer for the environment as well. You can buy X-TEX as well as the rest of ECO Solutions’ product range online and in stores – check out their website for more information. Thanks to everyone who took part in the competition – we can announce that the winner is Anthony Farrell, of PBA Decorating Services. We hope you enjoy your X-TEX Anthony! Home Strip/Trade Strip Paint Remover – A non-toxic solvent free paint and varnish remover that requires no ventilation and can be used by asthma sufferers. Brush Renew – This product brings your old, paint encrusted brushes back to life and removes both water and solvent based paints. Hand Cleaner – A great al round cleaner to remove paint, ink, oil and any other stains from your hands without the harshness of a solvent formulation. Graffiti Go! – A non-toxic, effective remover to finally get rid of any graffiti on your walls or fences. X-TEX – And finally, X-TEX Textured Coatings Remover – this removes all kinds of textured coverings, including Artex, leaving your wall or ceiling ready for redecoration. You can buy products from ECO Solutions’ range for safe paint and covering stripping either online or in stores nationwide – find your local stockist on ECO Solutons’ website.